The proportion of the population using wheelchairs increases sharply with age with roughly 3% of people over 65 using them. 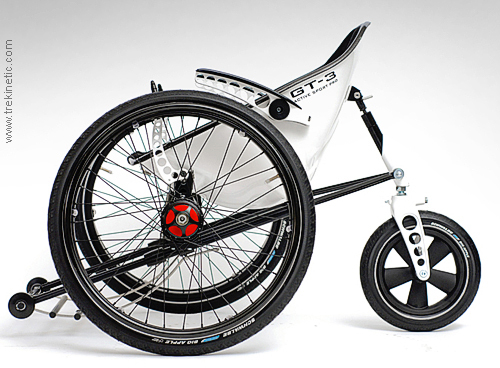 Accordingly, Trekinetic 3-wheel designs offers a revolutionary departure from conventional wheelchairs. As the All Terrain K2 model, the GT3 has been developed for style conscious individuals, but more city-focused. Key features include a carbon fibre, auto-recline seat, nitrogen shock absorber, adjustable wheel camber, rain protection, independent wheel braking and full fold ability. Dimensions mm: 400/480(Seat)x 710-890(Width) Front wheels: 610mm. Inside Out: The Trekinetic story.